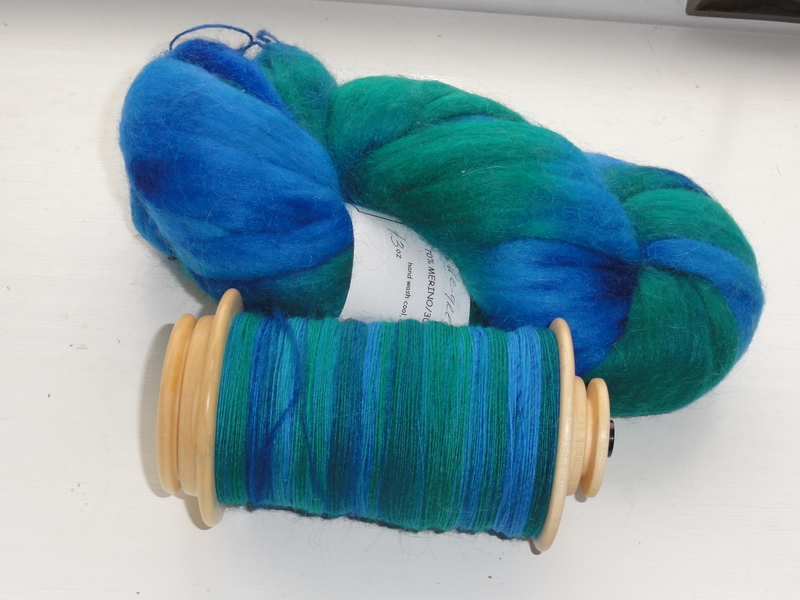 So, here’s my finished object–a bobbin full of Blue and Green Merino/mohair blend fiber from Wolf Creek Wools. As you can see from the picture, I have another hank of the fiber to spin. I’m going to start spinning it later today. My original plan was to make this yarn into a true 3-ply, because my first attempt at chain-plying on my wheel was, um, abysmal. 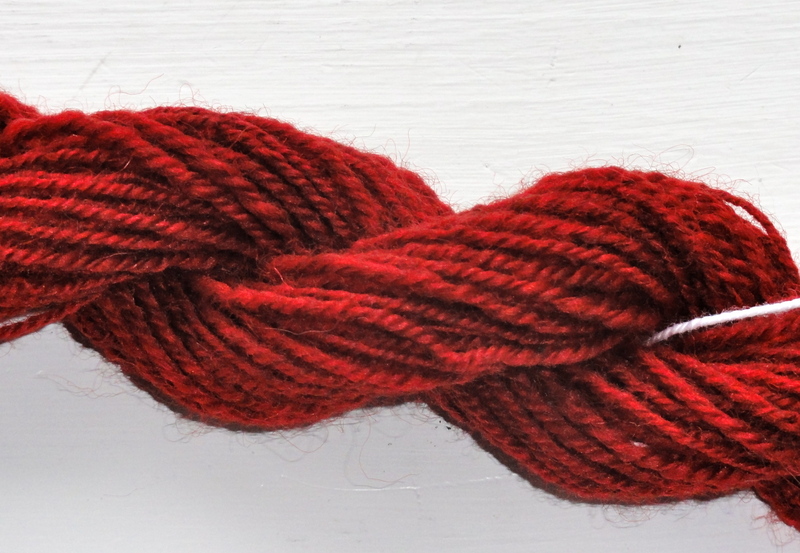 But now that my abysmally chain-plied yarn has been washed, dried, and skeined, I’m thinking it actually looks not all that bad. Yes, it is definitely over-plied in places. And the yarn isn’t as balanced as I would like. This close-up show how over-plied this yarn is. But it’s not nearly as bad as I thought it was going to be before I set the twist. In fact, it isn’t really all that bad, especially considering it was my first effort at chain-plying on my wheel. So now I’m thinking I’ll chain-ply the Blue and Green singles on my wheel. Once I get the tension properly adjusted, I think the results will be better than with the red singles. And it won’t hurt that the Blue and Green singles are a lot more consistent than the red ones. This entry was posted in Spinning and tagged chain plying, FO Friday, Merino/mohair fiber; Wolf Creek Wools, Schacht Ladybug spinning wheel, Wool of the Andes roving. Bookmark the permalink. Nifty! I haven’t tried chain plying. Tried it once on a drop spindle . It didn’t go so well. YES!! I secretly really, REALLY wanted you to chain ply this! I almost asked if you would consider chain plying a small sample just so we could see it! I figured that would be being TOO nosey, LOL!! I’m that ridiculous. But, the color in this will be so lovely preserved in its original order. Can’t wait to see it when you’re done! Edited to add: I’ve been toying around with ways I can adjust the tension on my kate. I think if I use a piece of string instead of the stretchy band, I can get a tension that will allow the singles to feed off the bobbin easily and smoothly but not allow the singles to twist on themselves.